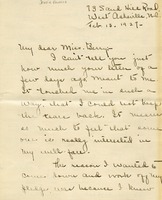 Mr. B.W.R writes Miss Martha Berry appreciative of the 25th Anniversary Trip. 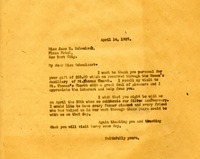 Letter to Elisa Richards from Martha Berry thanking her for gift for the 25th anniversary of the schools. Miss Berry informs her that it touched her heart to receive her gift and to have her with them at Berry for the Silver Anniversary. Miss Berry informs her that she always loved to have former teachers and students back at Berry and thanks her again for making the occasion a happy one for her. 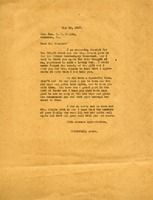 A letter to Martha Berry from Georgia Robertson in response to a thank you letter that Berry sent to Robertson. 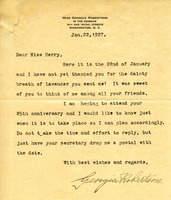 This letter was sent around the time of the Silver Anniversary. Jane E. Schmelzel tells Martha Berry that the $50 check she sent was her personal money and was sent in honor of the Berry School's 25th anniversary. 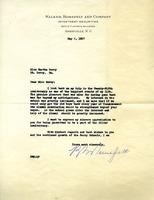 Martha Berry sends a receipt for the $25 given for the Silver Anniversary Endowment. She also thanks Mr.Sample for his work at the Berry Schools. Miss Schemelzel donates $50 for the 25th Anniversary of the Berry Schools. Mrs. Rosentreter thanks Martha Berry for the book commemorating the 25th anniversary that she received. She also says she is trying to persuade some of the D.A.R. members she knows to help the school. 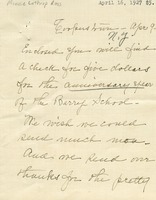 After celebrating Berry's twenty-fifth anniversary, Martha Berry requests $150 in order to keep Berry's students in school. 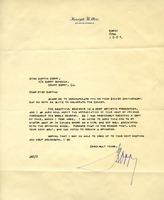 Kate L. Reynolds writes to Martha Berry explaining that she wishes she could send a great big check but asks that her mite be added to the Silver Anniversary fund. She says that the check is sent with many good wishes and says she's hoping that the Schools will get at least a million dollars. 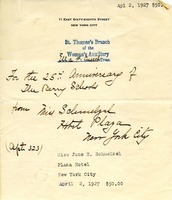 In this letter Martha Berry writes a personal thank you note to Miss Schmelzck for her donation of 50$ through the Women's Auxiliary of St. Thomas Church. 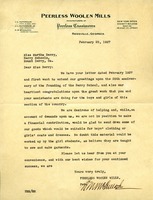 H. M. McCulloch, a representative from Peerless Woolen Mills, offers to send the Berry School some of their goods, including boys' clothing and girls' coats and dresses. Jessie Powers writes to Martha Berry to let her know that she's been ill and will not be able to pay off her pledge before the 25th Anniversary.